Film critics frequently describe Martin Scorsese’s After Hours (1985) and Steve De Jarnatt’s Miracle Mile (1989) as “nightmarish,” but they do not explain how the films evoke this impression. Drawing on recent scholarship in cognitive studies of film, this article shows how the films encourage us to empathize with protagonists experiencing frustration and anxiety, two ingredients of nightmares. Released in the United States less than four years apart, Martin Scorsese’s After Hours (1985) and Steve De Jarnatt’s Miracle Mile (1989), betray remarkably similar narrative structures. In each film, a male protagonist finds himself trapped in a world in which chance and coincidence continually thwart his ability to attain a relatively modest goal in a limited period of time. In After Hours, Paul Hackett (Griffin Dunne) struggles to return to his apartment in uptown Manhattan following a late night excursion to New York’s Soho neighborhood; in Miracle Mile, Harry Washello (Anthony Edwards) scrambles to find his new love interest, Julie (Mare Winningham), and reach a nearby helicopter pad in time to escape an imminent nuclear attack on Los Angeles. Along the way, each protagonist apprehends a cast of characters who frustrate his attempts to attain his goal. In their basic narrative forms, After Hours and Miracle Mile rhyme with comedic “road films,” like Planes, Trains, and Automobiles (1987) and Harold and Kumar Go to White Castle (2004), in which characters seek to achieve modest objectives but are derailed by a barrage of comic distractions. 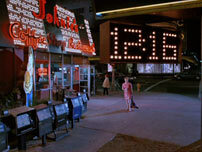 However, reviewers responding to After Hours and Miracle Mile frequently described the diegetic worlds traversed by Paul and Harry with a particular adjective: nightmarish. A review in Film Quarterly noted the film’s “nightmarish contemporary landscape” (Van Daalen 1988, p. 31), and film historian Harry M. Geduld, writing in The Humanist, described After Hours’s narrative as a “love story turned nightmare” (1985, p. 39). A staff writer for Variety deemed the film a “nightmarish black comedy” (1985, p. 145), Pauline Kael labeled its setting a “nightmare world” (1985, p. 101), and Roger Ebert watched the film “building its nightmare situations step by insidious step” (1985) (1). (1) Such phrases are reiterated in additional reviews of After Hours, including those provided by Andrew Kopkind (1985, p. 623) and Andrew Sarris (1985, p. 54). Although a number of other critics do not employ the descriptors “nightmare” or “nightmarish,” they nevertheless liken the narrative to an ominous tale (Kauffmann 1985, p. 26; Canby 1985, p. C6). Reviews stimulated by the DVD release in 2004 reinvigorated the nightmare metaphor (Tobias 2004). (2) See also Richardson (1989, p. C4) and Holden (1989, p. CC16). I cite these reviews not as a means of implying a falsehood about film critics – that they might possess a limited vocabulary of descriptors – but rather, to suggest that the frequency with which the term “nightmare” appears in their reviews may reveal something significant about the effect of Miracle Mile and After Hours on the affective states of the films’ spectators. Put frankly, what about these two films evoke an impression of the nightmarish? Although this question immediately brings to mind the oneiric metaphor of film theory, which compares films and dreams, this essay formulates an answer by drawing on more recent scholarship in the field of cognitive film studies. The oneiric metaphor has remained a persistent model for film theory and has inspired an abundance of film criticism, but it is not very effective in helping us to understand how films generate particular cognitions and emotions in spectators (3). A cognitivist approach to After Hours and Miracle Mile can explain how film form functions to produce an impression of frustrated and anxious characters who, in turn, foster a comparable affective state in film spectators. (3) Laura Rascaroli (2002) traces the appearance of the oneiric metaphor over the course of film theory, from the French Impressionists of the 1920s through psychoanalytic film theorists of the 1960s. But, as Noël Carroll (1988) has shown, the oneiric metaphor is rife with logical flaws and shortcomings, which are especially evident in contemporary film theory. After Hours and Miracle Mile share two salient traits that give rise to frustration and anxiety, the prototypical qualities of nightmares. The first of these traits is restricted narration, which limits what we know about a narrative to knowledge acquired by a particular character. For instance, as David Bordwell reminds us, the conventional detective film tends to limit what we know to what the detective/protagonist knows. Most films regulate their use of restricted narration, distributing it across multiple characters and to varying degrees. Even detective films often depart from the rule of restricted narration in order to provide us with more or less information than the character. By giving us knowledge of events and withholding that knowledge from characters, detective films produce effects of curiosity or suspense (Bordwell 1985, p. 64-65). But After Hours and Miracle Mile are remarkable because they grant spectators nearly complete and exclusive access to a single character. With very few exceptions across each film, we travel through the neighborhoods of Soho and Miracle Mile along with Paul and Harry, respectively, learning about characters as they learn about them and discovering answers to questions as they discover them. Very rarely do we receive information unavailable to Paul or Harry, and when we do, the effect is neither one of suspense nor curiosity. For example, as Harry sleeps through the night, his alarm clock defunct, we see Julie waiting outside Johnie’s Coffee Shop Restaurant, where she has agreed to meet Harry at the end of her work shift (fig. 1). As a means of telling us that Harry misses his date, the scene is unnecessary, for we could have deduced as much from our knowledge of his burnt-out alarm clock. But the scene functions to introduce us to a crucial space: the telephone booth. From the booth in which Julie calls Harry (fig. 2), Harry will later answer a misdirected phone call from an anonymous man, Chip, who works at a North Dakota missile silo and claims that nuclear warheads are set to strike Los Angeles in fifty minutes (fig. 3). Other than rare exceptions such as this, however, each film utilizes its central protagonist as the primary conduit for disseminating narrative information to the film spectator. When a character becomes our primary source for narrative information, we experience what Murray Smith calls “alignment,” an attachment to that character because we have continual access to their spatiotemporal surroundings as well as access to their subjective states (Smith 1995, pp. 83-84, 142-146) (4). I argue further that as a result of their use of highly restricted narration, After Hours and Miracle Mile encourage us to empathize with the protagonists – that is, to adopt affective states comparable to those of the characters. As Berys Gaut writes, “If our knowledge of what is fictional in the film corresponds to a high degree with that of a particular character, there is a tendency to identify affectively and to empathize with the character” (p. 210). By adopting a character’s narrational point-of-view, we are likely to emulate the character’s affective state (Gaut 1999, p. 208; Smith 1995, p. 81; Neill 1996, p.186). In order to increase the likelihood of spectatorial alignment and empathy, filmmakers exploit techniques of editing and mise-en-scène. The most obvious device of visual style that serves such purposes is the optical point-of-view (POV) shot, which presents the spectator with exactly what the character sees. One might argue, therefore, that if a filmmaker wished to create a film with purely restricted narration, and limit a spectator’s understanding of narrative information solely to a character’s perceptual observations, then her film should consist of a series of optical POV shots, like Lady in the Lake (1947). 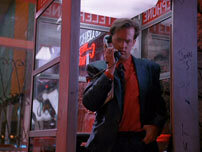 But neither Miracle Mile nor After Hours contain an extraordinary number of optical POV shots. How do they use restricted narration to generate empathy in spectators? There are two responses to this question. One is that although each film does not contain a series of optical POV shots, they tend to situate the protagonist in proximate surroundings to what the spectator sees, so that there exists the possibility of the protagonist sharing in the spectator’s observations. 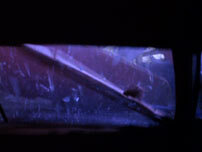 For example, a scene in After Hours begins with a shot of two thieves exiting an apartment building with stolen goods. One thief complains that his statue was stolen, and the duo continue to chat as they climb into their van and drive away. At first, Paul is nowhere to be seen, but as the van pulls away to the right, the camera pans left and Paul appears on the left side of the screen (fig. 4-7). While we may deem it unlikely that Paul heard their conversation, the possibility exists. The point is that the film provides us with roughly the same access to narrative information that it provides to Paul. A second response is perhaps more convincing. A number of cognitivists have argued that optical POV shots are not the most effective way to communicate a character’s affective state to an audience. Expressive reaction shots are superior (Smith 1995, pp. 158-159; Gaut 1999, pp. 209-210; Currie 1995, pp. 174-75). An actor’s performance, which shows us facial gestures and other bodily cues, often reveals more about a character’s subjective state than that which is revealed by an optical POV. Smith writes, “The more a film attempts to render in a literal fashion the subjectivity of a character through the adoption of optical POV, the more it surrenders the power to evoke the full range of a character’s mental states, through the powerful mechanism of facial expression” (p. 160). Fig. 1-3. Miracle Mile. The telephone booth. (4) Literary theorists Gérard Genette (1980, p. 162) and Mieke Bal (1997, pp. 142-161) call this process “focalization.” Edward Branigan (1992, pp. 100-107) describes the process of focalization with respect to film narration. Fig. 4-7. After Hours. As the van pulls away to the right, the camera pans left and Paul appears on the left side of the screen. Miracle Mile inserts an optical POV, shot through a car windshield, that belongs to an ancillary character who has smashed a car through the window of a department store (fig. 8). But it is the shot that follows, Harry’s reaction of surprise (fig. 9), that De Jarnatt emphasizes, here by means of a longer shot duration. In After Hours, Scorsese alternates a series of shots representing Paul’s optical POV with his reaction shots, depicting the protagonist’s escalating anxiety (fig. 10-14). The dramatic intensity of the sequence builds as Paul races on the street (fig. 15), finally falling to his knees and, with outstretched arms, shouting to an unknown listener his expression of frustration, “What do you want from me? What have I done? I’m just a word processor, for chrissakes!” (fig. 16). As these examples show, a director need not infuse a film with optical POV shots in order to encourage an audience’s alignment with a character’s subjective state. Restricted narration, used in conjunction with expressive reaction shots, can cue viewers to understand and empathize with the affective state expressed by a protagonist. In addition to highly restricted narration, After Hours and Miracle Mile share another trait: they lack a definable antagonist. Most fictional narrative films feature a character who intentionally provides a complicating action, which in turn prevents the protagonist from attaining her goal until the narrative’s resolution. 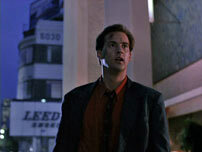 But After Hours and Miracle Mile contain no such antagonist. Instead, narrative obstacles and challenges are presented as functions of chance and coincidence. These mechanisms constitute the dominant, governing principle of narrative organization in each film (5). Consider, for example, a few consecutive sequences from After Hours. The film’s first major plot point occurs at approximately thirty minutes into the story, when Paul becomes annoyed by Marcy’s (Rosanna Arquette) cryptic conversations and decides to return to his apartment in uptown Manhattan. Upon leaving Marcy’s place, he descends into a subway station, where he is informed by the ticket attendant that the fare increased from $0.90 to $1.50 less than three hours ago, at midnight. Refused entry to the subway, Paul returns to the streets and seeks refuge from the pouring rain at the nearby Terminal Bar. There, he befriends the bartender, Tom, as well as the server, Julie. When Paul reveals his predicament to Tom, the bartender offers to give Paul some spare change, but, by chance, his cash register is broken and will not open. Tom asks Paul to go to his nearby apartment and retrieve the special key for the register. Paul gets the key from Tom’s apartment, and for a moment we find ourselves believing that Paul will be able to return home, but on his way out of Tom’s apartment building, he is apprehended by two of Tom’s neighbors. They accuse Paul of breaking into the building illegally. Paul convinces them of his innocence, and they let him go, but the momentary delay enables Paul to notice two men hauling off a statue that resembles one which he saw at Marcy’s apartment. So, instead of returning to the Terminal Bar to exchange Tom’s keys for subway fare, he buzzes Marcy’s place. There he discovers Marcy’s lifeless body; later he learns that Marcy was Tom’s girlfriend. Throughout the remainder of After Hours, Paul is teased with opportunities to escape Soho and return home, but each of those opportunities is undermined by a chance coincidence. Miracle Mile foreshadows its dominant narrative principle of chance early on, when a cigarette flicked by Harry off his balcony ricochets through a chain reaction, ultimately causing Harry to miss his date with Julie, which places him at the phone booth just in time to receive the misdirected phone call (Brown 1989, p. 61). From this point onward, we see a series of chain-reaction intrusions that impinge upon Harry’s ultimate goal, which is to retrieve Julie and bring her to the top of a nearby insurance building, where they can escape by helicopter from Los Angeles. For example, once he manages to bring the clueless and bewildered Julie to the helicopter pad, Harry realizes there is no pilot. Leaving Julie to wait for him at the top of the building, Harry scurries frantically through the twilight streets of Los Angeles until he finds someone who can fly a helicopter. As he rushes with the potential pilot to the insurance building, Harry hears Julie’s voice in the distance; apparently, she has figured out what is happening and has decided to search for Harry. But Harry does not wish to leave Julie stranded on the streets, so he chases after her, forcing him to abandon the pilot in the meantime. Just as Harry and Julie are poised to reconnect, a cop car speeds between them and crashes into the window of a department store. Following this intervention, Harry and Julie unite, but the narrative pattern continues: small-scale goals are set and thwarted, and the primary goal seems less attainable every minute. One effect of a narrative’s heavy reliance on chance and coincidence is that, as Geduld points out, they are likely to be condemned “on the grounds of [their] implausible use as a mere deus ex machina for resolving plot complexities” (p. 39). As Andrew Sarris reported after viewing the first few scenes of After Hours, “Already I am having problems with the probabilities” (1985, p. 54). While the accumulation of coincidences might be appropriate in other dramatic genres, such as melodrama (Brewster and Jacobs 1997, pp. 25-27), it functions in After Hours and Miracle Mile to increase the level of frustration and anxiety felt by the protagonist. So much is obvious from the expressive reaction shots, like those described above, which depict Paul and Harry in affective states of shock, surprise, frustration, and anxiety – not unlike the states associated with a prototypical nightmare. Each protagonist becomes overwhelmed by his seemingly hopeless situations. Lastly, because the films’ systems of restricted narration provide viewers with continual and exclusive access to the protagonists’ affective states, we tend to empathize with their nightmarish experiences. This essay has sought to explain the nightmarish impression left by viewings of After Hours and Miracle Mile. I have argued that this impression is a result of restricted narration, the abundance of narrative coincidenes, and our propensity as film viewers to empathize with film characters. I will conclude by suggesting two avenues for further study and analysis. First, as mentioned at the outset of this essay, After Hours and Miracle Mile bear narrative structures similar to those of comedy road films. Additionally, After Hours has been cited as a dark comedy as frequently as it has been described as nightmarish. In this context, how do the films modulate two seemingly opposed affective states, namely, anxiety and comic reactions? A comparative analysis with comedy road films could help to explain the ways in which After Hours and Miracle Mile elicit a range or mix of emotional states from viewers. Certainly the presence of comedian performers, as well as comic dialogue, distinguish the comedy road films, but a more detailed analysis, perhaps one which considers spectatorial alignment, is warranted. This first avenue suggests a second. Although character frustration builds steadily throughout After Hours and Miracle Mile, critical response suggests that the films also sustain a constant and pervasive tone of frustration and entrapment. Here Greg M. Smith’s (2003) theory of “mood cues” would prove especially fruitful. According to Smith, moods and emotions are mutually dependent: emotional jolts sustain longer-lasting moods, and moods prime audiences for individual emotional jolts. Smith’s model could help explain how After Hours, Miracle Mile, and other films possessing similar narrative structures, produce more or less constant tonal levels of comedy and frustration, and the effect of those varying levels on viewers’ affective states. The author wishes to thank editor Jakob Isak Nielsen for his insightful and incisive comments on an earlier version of this essay. Fig. 8-9. Miracle Mile. We are presented with an optical POV of an ancillary character who smashes a car (fig. 8) but it is Harry’s reaction of surprise (fig. 9) that is given more prominence. Fig. 10-14. After Hours. Scorsese alternates a series of shots representing Paul’s optical POV with his reaction shots, depicting the protagonist’s escalating anxiety. Fig. 15. After Hours. Paul races on the street. (5) For more on the subject of the “dominant” as a principle of organization in film, see Kristin Thompson (1988), 89-97. Bal, Mieke. Introduction to the Theory of Narrative, 2nd ed. Toronto: University of Toronto Press, 1997. Bordwell, David. Narration in the Fiction Film. Madison, Wisconsin: University of Wisconsin Press, 1985. Branigan, Edward. Narrative Comprehension and Film. London and New York: Routledge, 1992. Brewster, Ben, and Lea Jacobs. Theatre to Cinema: Stage Pictorialism and the Early Feature Film. Oxford: Oxford University Press, 1997. Brown, Georgia. “Magi Tar Pit Ride.” Village Voice (May 23, 1989), p. 61. Canby, Vincent. “Screen: After Hours from Martin Scorsese.” New York Times (September 13, 1985), p. C6. Carroll, Noël. “Film, Emotion, and Genre.” In Passionate Views: Film, Cognition, and Emotion, eds. Carl Plantinga, Greg M. Smith (Baltimore, Maryland: Johns Hopkins University Press, 1999), pp. 21-47. Currie, Greg. Image and Mind: Film, Philosophy and Cognitive Science. Cambridge: Cambridge University Press, 1995. Ebert, Roger. Chicago Sun-Times (October 11, 1985), accessed October 1, 2007. Ebert, Roger. Chicago Sun-Times (June 9, 1989), accessed October 1, 2007. Gaut, Berys. “Identification and Emotion in Narrative Film.” In Passionate Views: Film, Cognition, and Emotion, eds. Carl Plantinga, Greg M. Smith (Baltimore, Maryland: Johns Hopkins University Press, 1999), pp. 200-216. Geduld, Harry M. “The Long Arm of Coincidence.” The Humanist 46 (January/February 1986), pp. 39-40. Genette, Gérard. Narrative Discourse: An Essay in Method, trans. Jane Lewin. Ithaca: Cornell University Press, 1980. Gold, Richard. “Miracle Mile.” Variety (September 7, 1988), pp. 34-35. Holden, Stephen. “Waiting in California for the Next Big Bang.” New York Times (May 19, 1989), p. CC16. “In Brief: After Hours.” New Yorker (November 11, 1985), p. 27. Kael, Pauline. “Airhead’s Delight.” New Yorker (September 23, 1985), pp. 101-103. Kopkind, Andrew. “Films.” The Nation (December 7, 1985), pp. 623-624. Kauffmann, Stanley, “Hell and Other Matters.” The New Republic, (October 14, 1985), pp. 26-27. Neill, Alex. “Empathy and (Film) Fiction.” In Post-Theory: Reconstructing Film Studies, eds. David Bordwell, Noël Carroll. (Madison, Wisconsin: University of Wisconsin Press, 1996), pp. 247-259. Rascaroli, Laura. “Like a Dream: A Critical History of the Oneiric Metaphor in Film Theory.” Kinema (Fall 2002), accessed October 1, 2007. Richardson, John H. “Filmmaker Recalls Problems Posed by Uncompromising Script: The Long Road to Miracle Mile.” Globe & Mail (Toronto), (May 27, 1989), p. C4. Sarris, Andrew. “Stranded in Soho’s Mean Streets.” Village Voice (September 17, 1985), p. 54. Smith, Greg M. Film Structure and the Emotion System. Cambridge: Cambridge University Press, 2003. Smith, Murray. “Imagining from the Inside.” In Film Theory and Philosophy, eds. Richard Allen, Murray Smith (Oxford: Clarendon Press, 1997), pp. 412-430. Tan, Ed S. Emotion and the Structure of Narrative Film: Film as an Emotion Machine, trans. Barbara Fasting. Mahwah, New Jersey: Lawrence Erlbaum Associates, 1996. Thompson, Kristin. Breaking the Glass Armor: Neoformalist Film Analysis. Princeton, New Jersey: Princeton University Press, 1988. Tobias, Scott., “After Hours.” The Onion A.V. Club (August 23, 2004), accessed October 1, 2007. Van Daalen, Bill. “Reviews: After Hours.” Film Quarterly 41:3 (1988), p. 31. Variety Movie Reviews. “After Hours.” Variety (January 1, 1985), p. 145. Willett, Cynthia. “Baudrillard, After Hours, and the Postmodern Suppression of Socio-Sexual Conflict.” Cultural Critique 34 (Fall 1996), pp. 143-161.